You will earn 7,520 Reward Points. Earn 1 reward point for every 1 dollar spent. Vacuum cycle of 25-35 seconds. Variable vacuum setting with new vacuum sensor. Powerful, high quality 21 m3 /h Busch pump and vacuum dial guage. Gas flush for the addition of an anaerobic gas mixture and/or pillow-pack seal. Simple to operate electronic, touch pad controls with up to 30 storable programs. 1-speed, 1 1⁄4 H.P. motor, totally enclosed, permanently lubricated ball bearings, thermally protected. Tabletop models with a stainless steel housing and single 20" (508 mm) x 18" (457 mm) x 6.8" (172 mm) chamber. Model 350 furnished in 115/60/1, 14.2 amp, AC, ETL listed; Model 350D furnished in 115/60/1, 20.0 amp, AC, ETL listed. Model 350 includes a single 19" (485 mm) seal bar; Model 350D includes two 19" (485 mm) seal bars; provide high integrity double sealing with electric cut-off. Pump: Powerful, high quality 21 m3 /h Busch pump and vacuum dial gauge. Warranty: All parts, service and travel coverage for one year, excluding wear items. Finish/Construction: Tabletop models with stainless steel housing and single chamber. Cord and Plug: Attached 6-foot, flexible, 3-wire cord and plug for grounded receptacle. Gas Flush: Provides for the addition of an anaerobic gas mixture and/or pillow-pack seal. Controls: Simple to operate electronic, touch pad controls with up to 30 storable programs. Motor: 1-speed, 1 1⁄4 HP, totally enclosed, permanently lubricated ball bearings, thermally protected. Electrical: Model 350 furnished in 115/60/1, 14.2 amp, AC, ETL listed. Model 350D furnished in 115/60/1, 20 amp, AC, ETL listed. Vacuum Chamber: Single, stainless steel 18" (457 mm) x 18" (457 mm) x 6.8" (172 mm) chamber. Vacuum intervals of 1 to 99 seconds. Seal Bar(s): Model 350 includes a single 19" (485 mm) seal bar; Model 350 includes two, 19" (485 mm) seal bars; provide high integrity double sealing with electric cut-off. 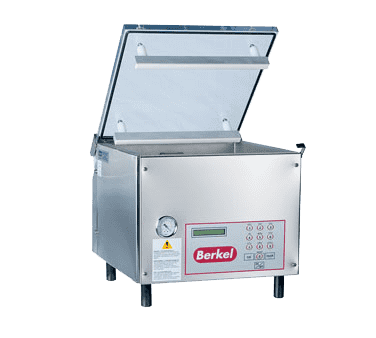 Berkel Models 350 and 350D are reliable tabletop vacuum package machines designed to meet most mid- to high volume foodservice portion control, product storage and food retail needs. The units offer a spacious stainless steel chamber, powerful, high-quality pump and single 19" (double on 350D) seal bar providing a high integrity double seal with electric cut-off. Both models offer an anaerobic gas flush to maintain product color in the vacuum package, extend shelf life and/or to provide a pillow-pack seal to protect the product. The units are simple to operate and maintain. New longer 19" Seal Bars. For vacuum packaging items to perfection, all you need is the Berkel 350D-STD Vacuum Packaging Machine. This vacuum packaging is 23 inches wide.